I have plenty of manis to share here, but I can't help but feeling like nail blogs are becoming a little irrelevant these days with Instragram pretty much taking over. That of course makes me pretty uninterested in posting much here. Of course blogs are way better for historical purposes, if you are looking for swatches and reviews or for specific nail art, but my blog views have really dropped off over the last 12-18 months compared to where they used to be and I'm feeling pretty 'meh' about it all really. I did always say that the purpose of my blog was for my nail polish chronicles, and if other people get something out of it then great. What do you guys think, are blogs becoming irrelevant? 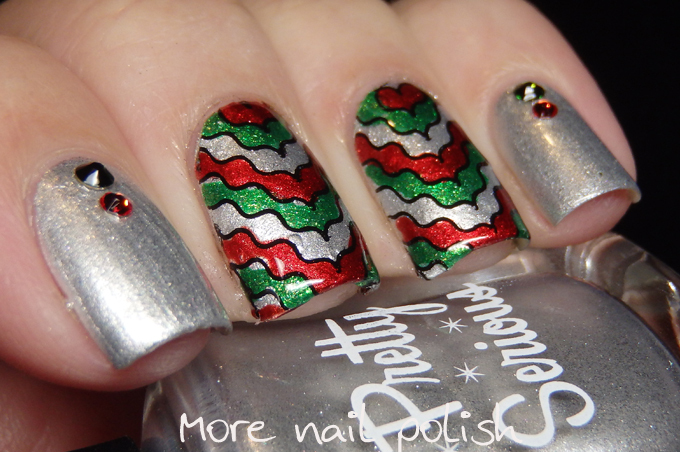 Anyway, let's look at today's mani, which I created using some of the polishes from the Pretty Serious Christmas collection. The silver is Frosty the Snowborg, red is Santa's Sunburn and the green is Hack the Halls. 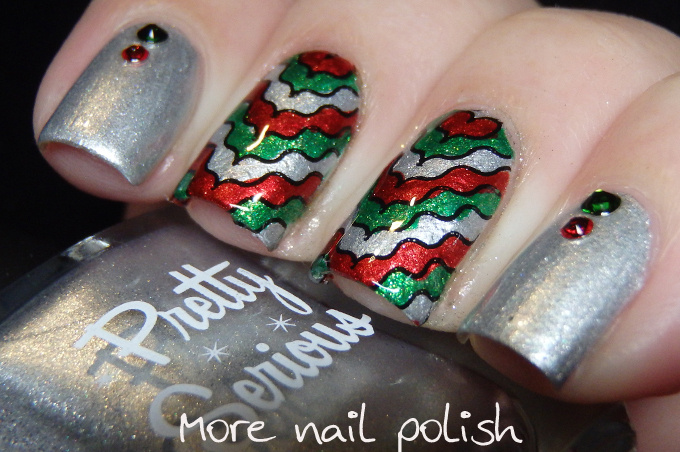 The polishes are all so gorgeous and I will be doing some swatches during the upcoming holiday season. I created a stamping decal using DRK Designer plate 1 stamping plate, which has lots of symmetrical designs that can easily be coloured in for stamping decals. Stamping plate provided for consideration, polishes purchased by me. Oh no no no! Blogs aren't irrelevant AT ALL! They can't be beat for reference and vital information. Also, they offer a privacy and intimacy which social media lack, and I love reading reviews etc. Please keep blogging! I love reading reviews, and how you did things. A picture is pretty, lacks a lot of information. Also, I've enjoyed getting to know the you behind the nails! I like so much more seeing blogs (with all their attendant information and insights into the bloggers character) than instagram. I don't even have an instagram account, I refuse. Please do not stop blogging! I come and check out what you've been doing every couple of days. I don't do Instagram, so if you gave away the blogging I'd never see your nails. Don't give up your blog! It's completely different to IG and still has its place. Blogs are definitely not irrelevant. Love your blog. I look for it every night and I put so many of your nails on my Pinterest board for easy access. I totally know what you mean, I've noticed it too and also felt like IG is taking over. Having said that... I'll keep on blogging, because it's my own little place on the internet, I enjoy messing with the blog, it gives me a lot more opportunity to say stuff, and it offers readers more as well. On IG I might have more followers, but unless I go out of my way to post at -for me- weird times, people often don't see my stuff there I think. I like the intimacy my blog offers, the contact feels more personal in such comments as well, and I enjoy looking back at previous posts. And not every one likes IG, having a blog opens up all kinds of social media, so I think they're far from irrelevant. And, as usual, lovely nails! I see what you mean, but please go on! I never visit Instagram, don't have an account (I refuse, just like Eva) and I love the more inside-information, reviews, how-to's etcetera! Ugh, don't get me started on this topic, I could ramble all day about how sad it is to see more and more blogs dying while IG accounts with their not at all color accurate photos are taking over. I wrote a whole post about it in the end of May this year. It is linked in the sidebar in case anyone want to have a look. It is so sad to see views dropping when you put so much effort into the blog. To make a long story short: I feel you, I am currently going through the exact same phase where I am thinking about taking a break, thinking about if it is still worth continuing to blog etc... I do love your nail designs, so I hope for you to gain your blogging mojo back soon. But if you do not feel like it, don't do it and do not feel bad about it. You do not owe anthing to anyone. Happy holidays! I see what you mean, but on the other hand I see a few Instagrammers start to consider starting a blog because IG is not a very good place to tell stories about your manis or do reviews. As you said, IG is a good place as a 'nail gallery' and for connecting & interacting with people, but information can easily get buried and hard to search. True that I have far less followers on my blog than my IG and Youtube, but I hardly check my blog stats and it never bothers me. I only write a short introduction on my mani and product review on IG, and tell people there's a full story on my blog if they're interested to know more. I personally don't see writing a novel-like review under one pic on IG serves as a very effective way to do a review (no offence for those who decide to do so). Also, when someone asks me about my past mani, I can easily go back to my blog post to revive my memory. So yeah, IG and blog has much different purposes, and I'm really sad if I can't get to see your blog posts :( Please don't let blog stats bother you too much, I LOVE reading your posts! Please don't stop blogging! Numbers of views may have dropped but it's quality not quantity (of us viewing) and those of us who never miss an 'instalment' are true fans who think of you as a friend giving us great advice. I have learnt so much from you and love to be able to go back to reference your great notes and instructions. Just have a great Christmas and know there are loads of us out here who look forward to each new post you do. Make your new year resolution not to check number of views and just enjoy sharing your talent! I completely understand what you mean...but, in my opinion, people who solely Instagram do not have the relationships that bloggers form, they cannot say very much at all in their posts compared to what bloggers say, they don't show as many photos, and I am yet to see any Instagram reviewer say in their post that the formula sucked when they've reviewed a polish that has a bad formula. Bloggers tend to be far more truthful with what they write I think. I, on the other hand, feel that Vloggers are becoming much more prominent because a lot of people would rather sit and watch and listen rather than read through a post for information and they can see actual live swatches or nail art, this I feel is what threatens a written blog. I guess it's something that bloggers must deal with. I think for searching for a specific nail art or polish, blog are still as important as ever. I don't type hashtags into Instagram to find out about a polish, I google it, and it's always a blog that I check out. Your blog Cathy, is a freaking Australian landmark in the polish world. Don't let your stats get you down! Oh No, I love reading the blog posts. Instagram is just a cute photo but the blog post tells a story. I love talking about nail polish and there isn't any talking on Instagram. I have noticed fewer and fewer bloggers posting these days though and that makes me sad. I much prefer blogs to a single pretty picture any day. I only post on Instagram and even then that is only to keep a log of my mani's and sometimes a place for the 31 day challenge. I may not be a blog writer, but I am a reader and even though I don't often comment, I am still here and reading. 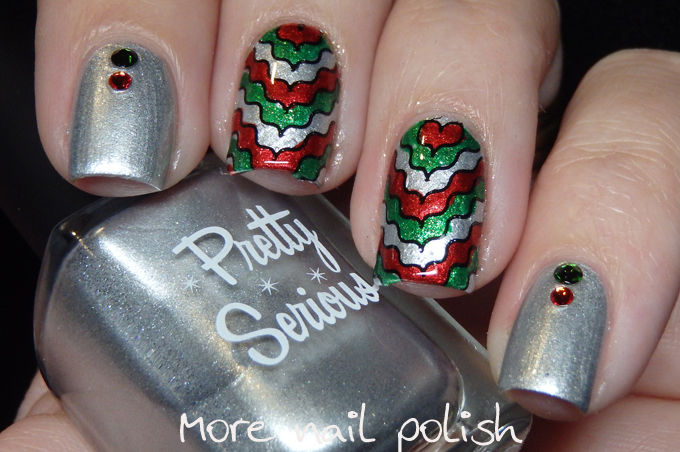 I love this polish blog! I really love your blog. It's actually the one I've been following the longest. I've found a lot of your posts to be inspirational as I try to elevate my own nail art. As someone who uses Instagram as well, I don't think it's a replacement for blogs at all. It's a major PITA to use when I have more than a couple words to say or read. I much prefer blogs.